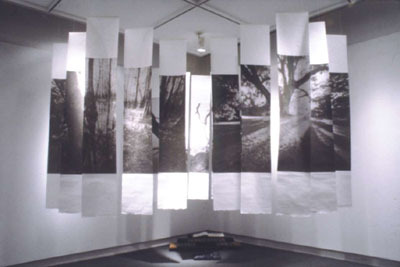 This installation was first shown at Georgia State University in May 2001 in partial fulfillment of the requirements for a Bachelor of Fine Art in Photography. 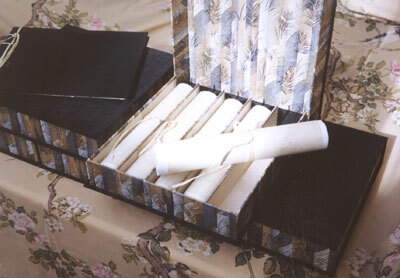 The scroll sets are stored in partitioned clamshell boxes which I made using book board, two types of Japanese paper, and black raw silk bookcloth from Japan. 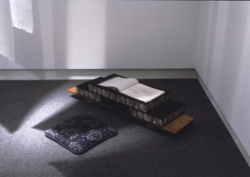 The boxes were displayed as part of the installation, along with a visitor book covered with the same raw silk bookcloth as the boxes. So far, there are five sets of scrolls, of which three were hung in this installation.